Analyst calls out Satoru Iwata for weak sales of the Wii U and failing to capitalize on the phone and tablet market. Game industry analyst Michael Pachter had harsh words for Nintendo CEO Satoru Iwata and his company's "underwhelming" Wii U sales. "I don't know why Iwata is still employed," the Wedbush Securities analyst said at the Game Monetization USA Summit, held this week in San Francisco. While he conceded that it was possible for new software to get people interested in the Wii U again, he ultimately predicted at most 30 million units sold over its lifetime, compared with predicted lifetime sales of 100 million to 120 million for the PS4 and 90 million to 110 million for the Xbox One. He also scolded Nintendo for not taking advantage of the mobile phone and tablet market, particularly with the shrinking audience for handheld systems. Pachter advised Nintendo putting Game Boy Advance games up as free downloads on mobile markets as well as offering more recent DS titles for between $3 and $5. This wouldn't just lead to more money for Nintendo but would create greater interest in their brands, he said. 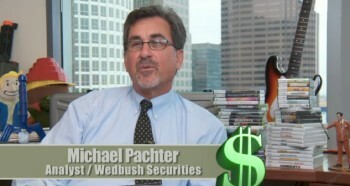 As you might have guessed from Pachter's sales figures, he had much nicer things to say about Sony's new console. "The graphics are phenomenal, and the huge RAM makes future innovation likely," he said. The biggest point in its favor, though, is that it comes in at $100 cheaper than the Xbox One. "The reason Sony beats Microsoft is solely the price," he said. "Microsoft loses the next generation unless they cut price. If Microsoft drops its price to $399, I expect the sales to be equal to the PS4." Despite this praise, he predicted the current generation of consoles to be the last, saying the future will hold more frequent model updates as opposed to new platforms. He also expects a renewed interest in the PC platform as time goes on.